Do you go from Christmas decorations to Valentine's Day? At our house we go to winter decorations after Christmas. 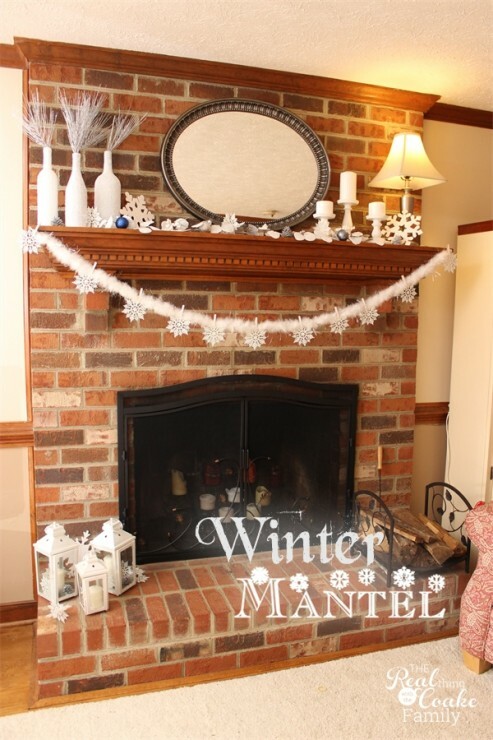 I had a lot of fun making my winter mantel decor. I've always wanted to have a winter mantel, but I only ever seemed to get enough done that it was just on the table or in the kitchen. This year, I changed that by doing a couple of quick 10 minute crafts to add to things I had made last year. I love the end result and will be happily looking at this winter mantel all January! Our wedding anniversary is also in February, so we go to Valentine's decorations for the entire month of February. Above the fireplace, I bought the garland you see on the mantel at Target for $6 on clearance after Christmas. Gotta love an inexpensive find that is perfect for what you need! I made the hanging garland really quickly and easily. 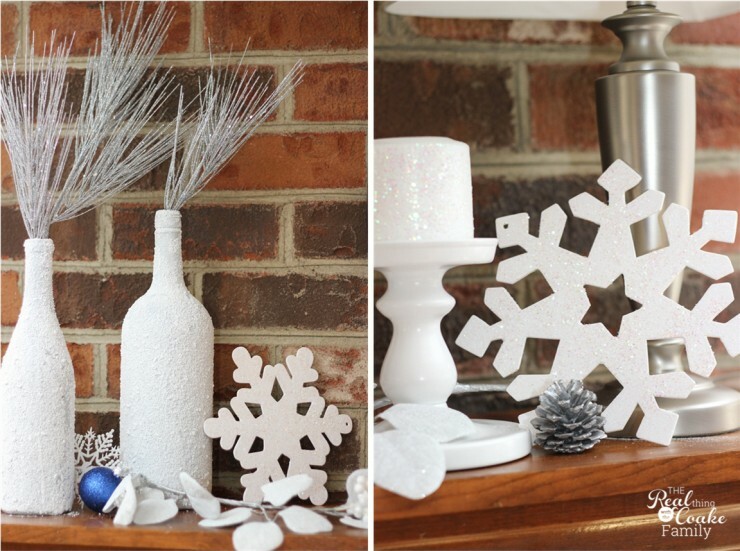 I bought a pack of snowflakes at Hobby Lobby during the Christmas season. I had two feather boas that I used in our Christmas tablescape in 2012 and in 2013. All I did to make the garland was to twist those two boas together. I used the glitter clothespins I showed you how to make last week and attached the snowflakes. 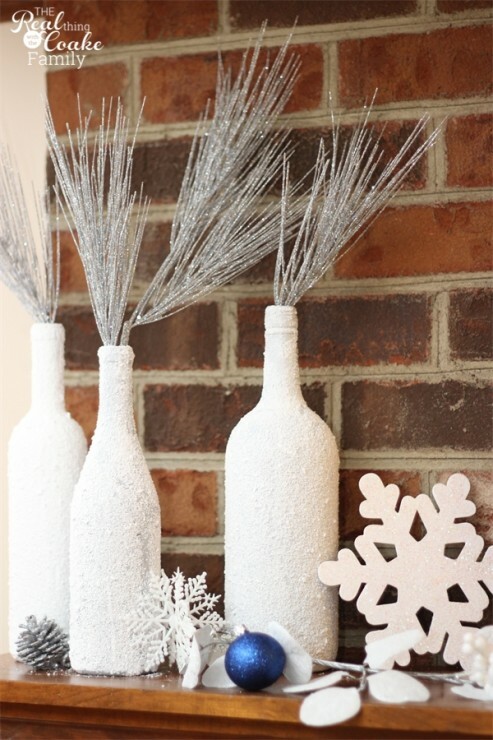 Easy peasy and so wintry and pretty! On the mantel, I used the wine bottle craft that I made last year and used in a winter centerpiece on the table last year. I am amazed that they actually faired well in my storage bin for the year. There were a lot of the Epsom salts in the bottom of the box, but the bottles look fine. As you can see, I added a few pinecones, small ornaments, little snowflakes, and the glitter snowflakes I showed you how to make earlier this week. I love the variety with adding a few of the snowflakes and the small ornaments. 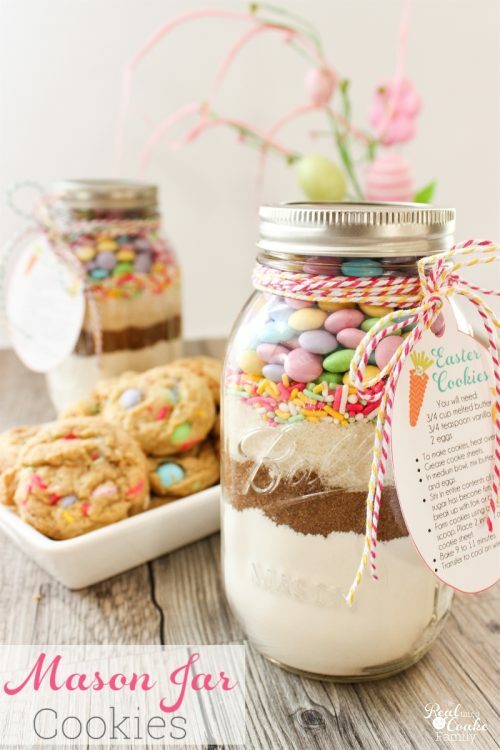 In the background you can see I also added the glitter candles I made. Yes, I know I have a glitter addiction…and I'm not working on it, I'm embracing it! Lol! On the hearth, I added the hurricane lamps I made over last year. 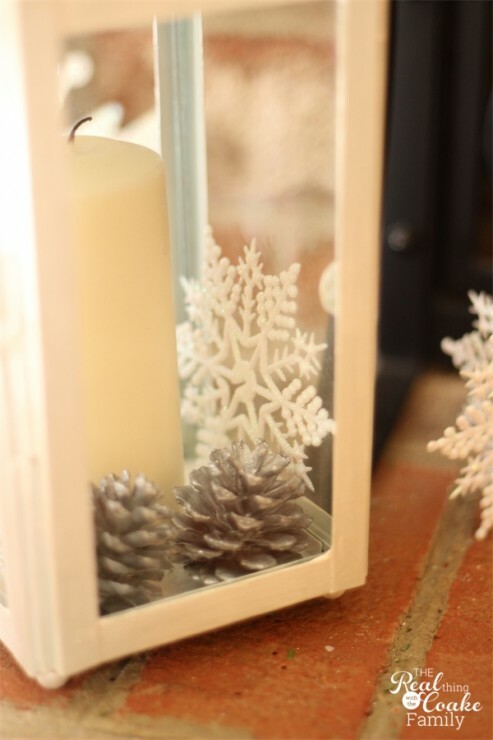 I changed the fill in them (from what I had at Christmas) to snowflakes and silver pinecones along with the same candles. I didn't light the candles for you this time because they had an funky odor last time. I think it was the new paint burning off and I don't like to take a chance with things like that. I guess they will just be for decoration unless I break down and get some flameless candles. So, there is my long desired and first attempt at a winter mantel. You may remember that I want to paint the mantel white. Can you imagine how pretty this would be with a white mantel? It would be even more wintry, pretty! Maybe next year, maybe next year. 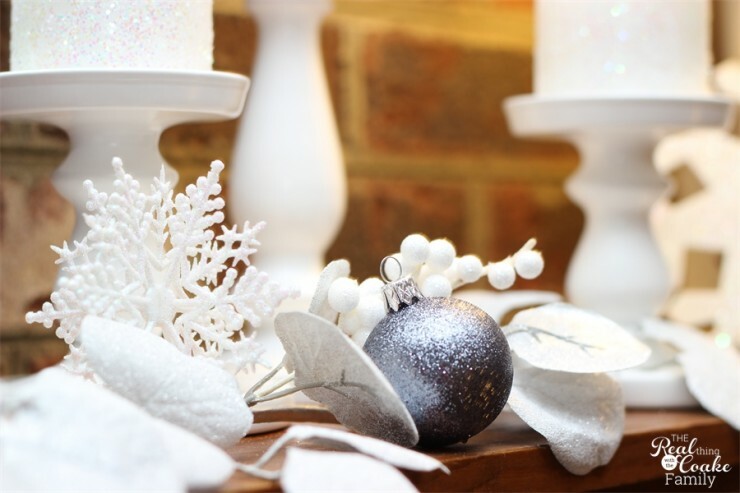 After Christmas, do you do Valentine's, winter, or other decorations? 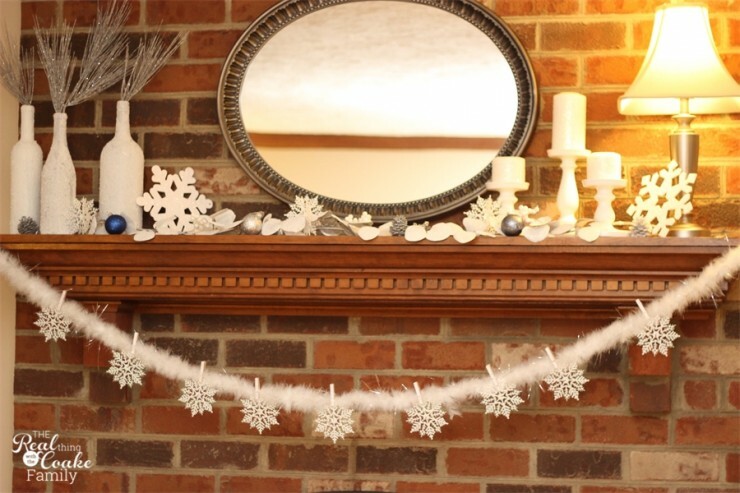 I simply love your transition from Christmas to winter mantel design! We are kind of in a blah stage right now as I’m considering a complete redo of our living room 🙂 My question – where do you find the hurricane lamps? 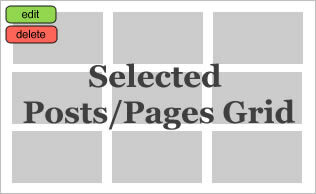 I cannot seem to find them anywhere, or at least where they aren’t so darn expensive! Any suggestions? Thank so you much, Shannon! I bought the hurricane lamps at target on clearance at the end of the summer in 2012. I recently did a makeover on them. There is a link in the post to that post if you want to see how they looked before I spent hours making them look like I wanted. Yes, they are expensive. Just keep your eye out for those on sale or clearance and if you have patience, you can make them over yourself to what you want. The mantel looks terrific. 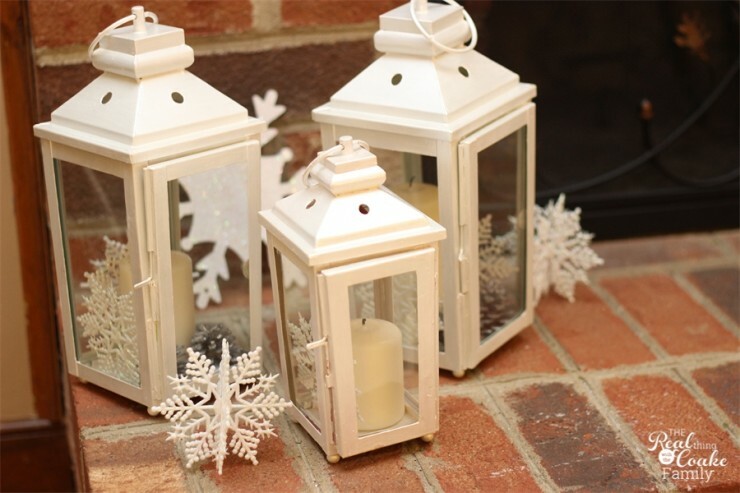 Winter is the perfect time for subtle, but classy decor. Even with that much white it still looks festive. 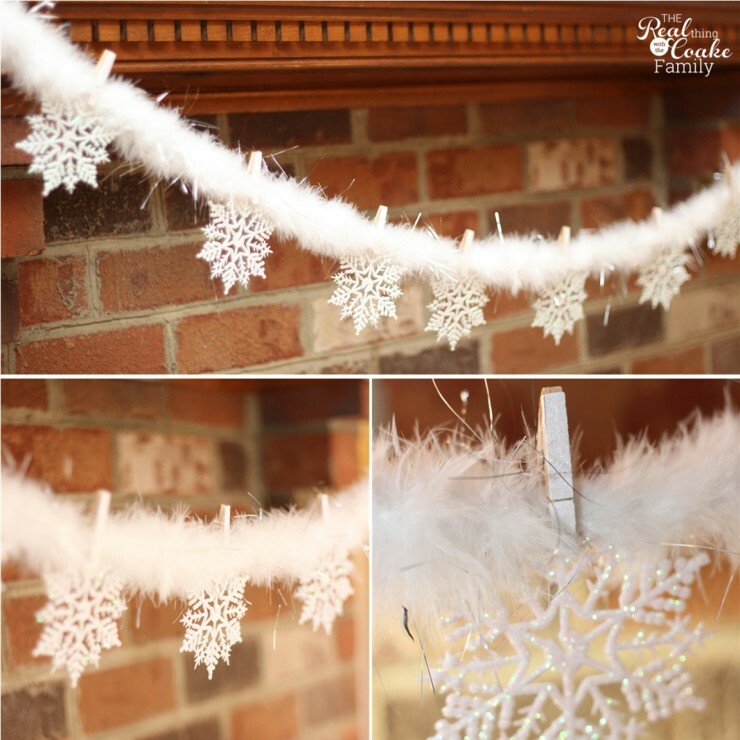 I have always wanted to do this after Christmas and I even have the same snowflakes but I am usually so worn out after Christmas I have never done it. But you have inspired me so hopefully this will be the year. Yeah, I totally understand. This was my first year to go all out and really do our mantel. I’ve done a small centerpiece on the table, but never the mantel. I really enjoyed it this year, so I bet I will do it again.